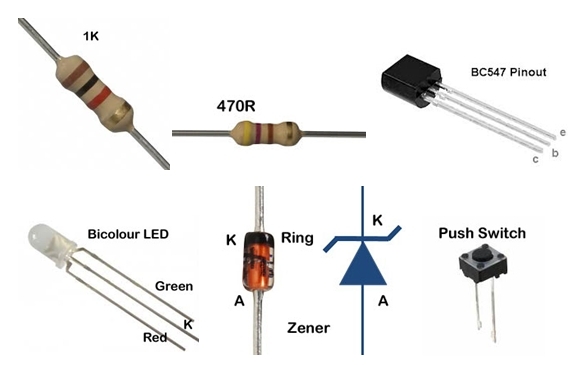 Two Zener diodes (ZD1 and ZD2) works like switches. 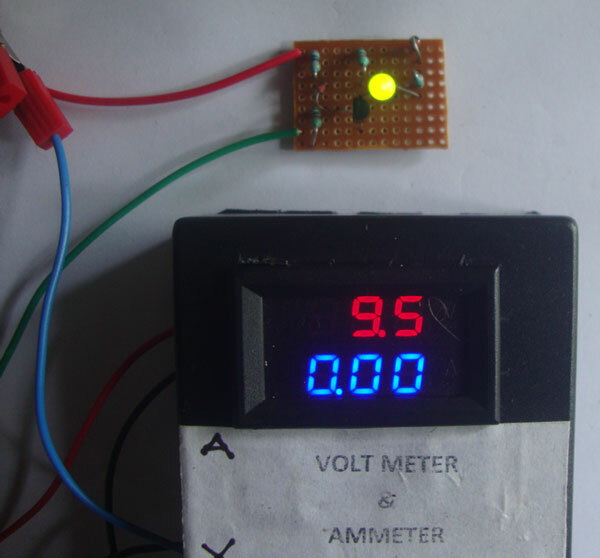 When the battery voltage is above 9 volts (A fully charged 9V battery shows 9.2 – 9.5 terminal Voltage), Zener diode ZD1 conducts and give full base current to T1. T1 then conducts pulling its collector voltage to ground potential. So the Red half of the Bicolour LED turns off. Green LED still lights since ZD2 is conducting. This gives Green colour to LED to indicate that the battery is fully charged. When the battery voltage goes below 7.5V, ZD1 turns off. T1 also turns off at this time. So Red LED turns on with full brightness than Green LED and due to visual perception, the LED looks like red. 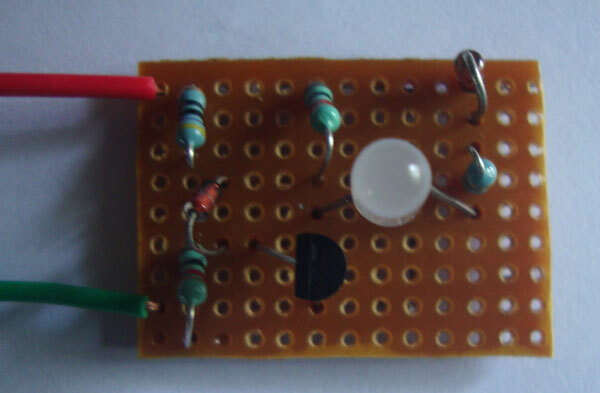 But between 7.5 and 9 V, there is partial lighting of both Red and Green halves giving Yellow colour to LED. 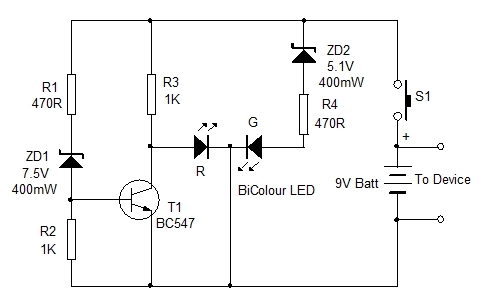 Connect the circuit to the device battery. 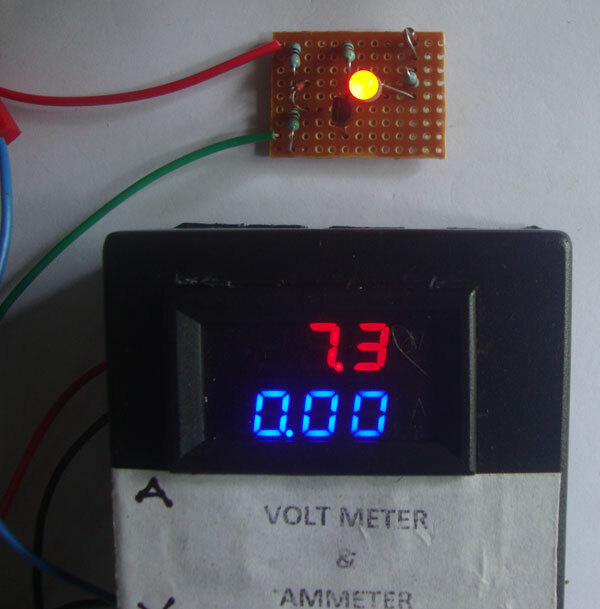 Press S1 to check the condition of the battery.For 12 volt battery, use 11V Zener as ZD1 and 8.2V Zener as ZD2.